Home » Drink » DRINKS – The Perfect Martini – Bond got it wrong! DRINKS – The Perfect Martini – Bond got it wrong! The dry vodka martini, shaken not stirred; perhaps the most iconic cocktail of all time. However the drink isn’t to everyone’s liking. That’s why expert mixologist-come-scientist, Stuart Bale from Strangehill (www.strangehill.co.uk) has worked with Gin Mare (pronounced mar-ray) to create the recipe for ‘The Perfect Martini’. Gin provides the foundation of a good martini as its layers of botanicals help to balance out the vermouth. In comparison vodka does not have this complexity of structure and in turn does not mix well with vermouth. Although it’s a complete no using an olive, that’s not to say there isn’t a more suitable garnish for a martini. With a softer, sweeter flavour, a whole strawberry or twist of lemon or orange can particularly complement the gin base of the cocktail. Looking to complement Gin Mare’s four principle botanicals of olive, basil, thyme and rosemary, Bale used a scientific process known as Gas Chromatography Mass Spectrometry (GCMS) to analyse the flavour chemicals of the premium Mediterranean gin, Gin Mare and three leading vermouths. This process revealed the prominent aroma compounds of Gin Mare and the vermouths and in turn revealed the perfect accompaniment/garnish for the serve. Having analysed thousands of chemicals present in the gin and vermouths Bale discovered those that correlated most frequently, were: 2,5 Dimethyl – 4-hydroxy-3(2H) Furanone, an organic compound found in strawberries. Therefore we introduce the The Perfect Martini, a classic gin martini stirred not shaken, paired with a whole succulent strawberry and drop of salt solution. Add all ingredients to a metal mixing tin filled with ice. Stir for between 20-30 seconds, until the drink is chilled and diluted appropriately. Taste using a straw, until ready and strain into a chilled, stemmed or coupe cocktail glass. 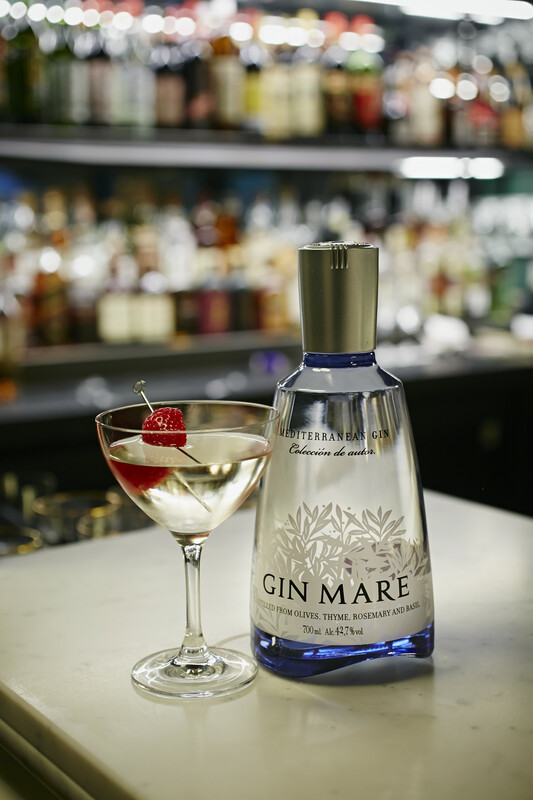 Gin Mare is available from Waitrose, Oddbins, Harvey Nichols and Whole FoodsRRP £38-£44.00. Gin Mare can also be bought online at Amazon.com, TheDrinkShop.com and TheWhiskyExchange.com and enjoyed in some of the best bars in London.